With the Maya apocalypse fast approaching, now is the time to start crossing some things off your bucket list. If you've ever wanted to stay on a private island, gamble with your life savings, or treat yourself to the best meal on Earth, you've got one week to do it. To help you decide how to spend what few days remain until December 21, we've compiled a list of 12 experiences you need to have before the impending apocalypse. So, what are you waiting for? It's time to start making your pre-doomsday plans! If the apocalypse really is on its way, wouldn't you like to hole up on your own private island with a group of your closest friends? For a mere $37,500 a day, you and 11 guests can have free reign of Musha Cay, illusionist David Copperfield's exclusive island resort, located approximately 85 miles southwest of Nassau, Bahamas. You can toast the end of the world from the Balinese Beach Pavilion restaurant, lounge along 40 white-sand beaches, or stay inside your private beach house filled with antiques and knick-knacks from the renowned performer's travels around the world. And if you fear the doomsday predictions, perhaps some of Copperfield's lingering magic will keep you safe. Even if you haven't yet decided where you want to be when the world ends, you can at least decide how to get there. Let's face it: If the final moments occur while you're in transit, you don't want to be stuck in coach. Instead, splurge on a first-class ticket on Emirates Airlines. For $19,000, you can fly round-trip from New York to Dubai in your own private cabin, complete with a personal mini-bar, adjustable ambient lighting, and a seat that stretches into a flat mattress for in-flight snoozing. And you'll have the crème de la crème of in-flight cuisine: In Emirates First Class, you'll dine on multi-course gourmet meals paired with sommelier-selected wines. If the recycled air clogs your pores, you can refresh yourself in one of Emirates' luxurious on-board Shower Spas. Even without today's modern technology, the ancient Maya people were able to predict astrological events--equinoxes, solar eclipses, and the like--with stunning accuracy. It is for this reason that, by ending their calendar this year, some believe the Maya predicted that the apocalypse will take place on the Winter Solstice in 2012. 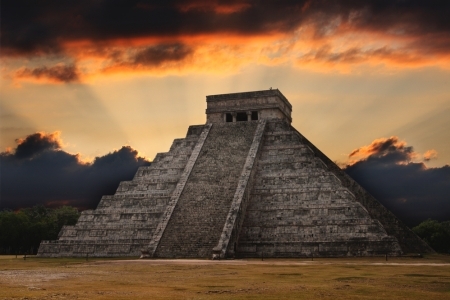 On the off chance the doomsday predictions come to fruition, what better place to be when the world starts crumbling than at the epicenter of Maya civilization, Chichén Itzá? And even if the world doesn't end, you'll still get to marvel at a UNESCO World Heritage Site (and have easy access to Yucatán sands in nearby Cancún). When the world ends, things are going to get ugly, so maybe you'd prefer to hunker down in some high-security digs. But if the thought of riding out the apocalypse in an underground shelter with only canned food for sustenance sounds abhorrent to you, retreat to the Royal Penthouse Suite at the Hotel President Wilson in Geneva, Switzerland. At $65,000 a night, the Royal Penthouse Suite stands as the most expensive hotel room in the world. But it oozes luxury, from its flat-screen Bang & Olufsen BeoVision media system to its Steinway grand piano. Plus, it comes equipped with bulletproof doors and windows (just in case). And if the whole Armageddon thing takes a turn for the worse, the hotel offers helicopter-evacuation service for guests. Why not ride out the end of the world on a ride to the end of the world? Puns and wordplay aside, a cruise to Antarctica is one of those once-in-a-lifetime experiences... and time is running out. 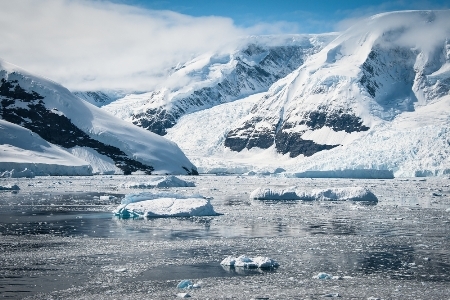 Silversea Expeditions still has spots available on two 10-day Antarctic cruises departing before December 21, with trips that cost anywhere from $8,000 and $23,000 depending on which cabin you book. (Though you may as well splurge--once the apocalypse hits, you won't have to worry about credit card bills.) While the rest of the world is falling apart, you could be cruising the Drake Passage aboard the Silver Explorer and snapping pictures of glaciers and penguins. There has never been a better excuse to eat your feelings than the impending end of civilization as we know it. Since every meal might be your last, make each one count by dining at only the finest restaurants. Topping the list of Restaurant magazine's annual World's 50 Best Restaurants round-up is Copenhagen's Noma, where Chef René Redzepi serves up North Atlantic seafood and game, along with his edible "soil" created from malted grains. Next, head to Girona, Spain, and feast on the Roca brothers' fine Catalan fare at El Celler de Can Roca. While you're in Spain, make a side trip to San Sebastian, Spain where you'll find Mugaritz--No. 3 on Restaurant magazine's list. Here, sample some of Andoni Luis Aduriz's avant-garde desserts. After all, it only makes sense to end life on a sweet note. All this talk about end times might make you want to reach for a bottle. But if you're planning on drowning your sorrows, you might as well be swilling the best stuff on Earth. Wine Spectator magazine named Shafer Vineyards' 2008 Relentless the best wine of 2012, so venture to Napa Valley and get your hands on a $63 bottle of this Syrah and Petite Sirah blend (there are only 3,300 cases available). If you prefer grains to grapes, jet set to Shimamoto, Japan (yes, Japan) for Whisky Magazine's World's Best Single Malt of 2012: Yamazaki Distillery's 25-year-old whisky. A bottle retails between $580 to $970 USD, but what's a few hundred dollars at the end of civilization? Bottoms up! Should the Maya apocalypse occur, not only will human civilization vanish forever--so will the planet's natural wonders. Now is the time to feast your eyes on some of Earth's impressive geological features and natural phenomena before they're gone forever. 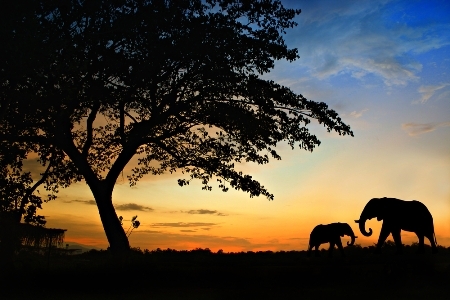 Paddle the Amazon River's cloudy waters or float in Israel's Dead Sea; witness Serengeti's Great Migration or stroll with giant tortoises on the Galapagos Islands; traverse the Sahara Desert or dive the Great Barrier Reef. Even if the predictions are false, pristine places on Earth are vanishing fast, so you better see them before they disappear. Maybe you'd prefer to avoid the end of the world altogether. With today's technology, leaving the planet could very well be an option. For $200,000, you can book a seat on Virgin Galactic SpaceShipTwo's maiden voyage into outer space. As you hurtle upward toward the unknown, you may want to take one last look back at the spent husk of Earth from your seat aboard the 60-foot-long spacecraft (its overhead windows provide plenty of viewing opportunities). The ship's launch date is still unconfirmed, but if the Earth's mountains start to crumble into the seas, Virgin Group Chairman Richard Branson might see fit to get those shuttles in the sky ASAP. At this point, the stress of preparing for the apocalypse may have manifested into aches, pains, and tension. If that's the case, it's time to unwind at the spa. Venture high into the Himalayas (about a seven-hour drive north of Agra, India) and you'll find a grand palace that was once the home to important heads of state. In the palace sits Ananda in the Himalayas, which Condé Nast Traveller named the No. 1 spa in the 2012 Readers' Spa Awards. Some time at Ananda will surely take your mind off of your impending doom. Indulge in an Ayurvedic Abhyanga massage--where two sets of hands will rhythmically knead oil into your skin and erase any lingering morbid thoughts. If that doesn't work, try a 45-minute meditation session to clear your mind and attain nirvana. With this level of pampering, the End of Days will be an afterthought. With the end fast approaching, it's time to get your kicks--and quick! 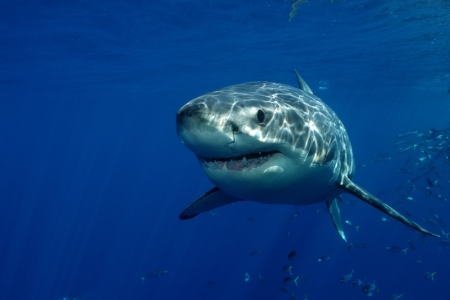 For the ultimate adrenaline rush, descend below South Africa's waters to come face to face with one of the planet's most fearsome predators: the great white shark. Don't worry--you'll be submerged in a cage made from galvanized steel mesh, so the sharks won't be in biting range. But the excitement of seeing these powerful animals in a feeding frenzy is enough to get your heart racing.